The General Motors DUKW (Duck) was an amphibious vehicle used by the allies in World War 2. It was designed by a team led by an American racing sailboat designer, and they based it on the standard 2.5 ton truck. 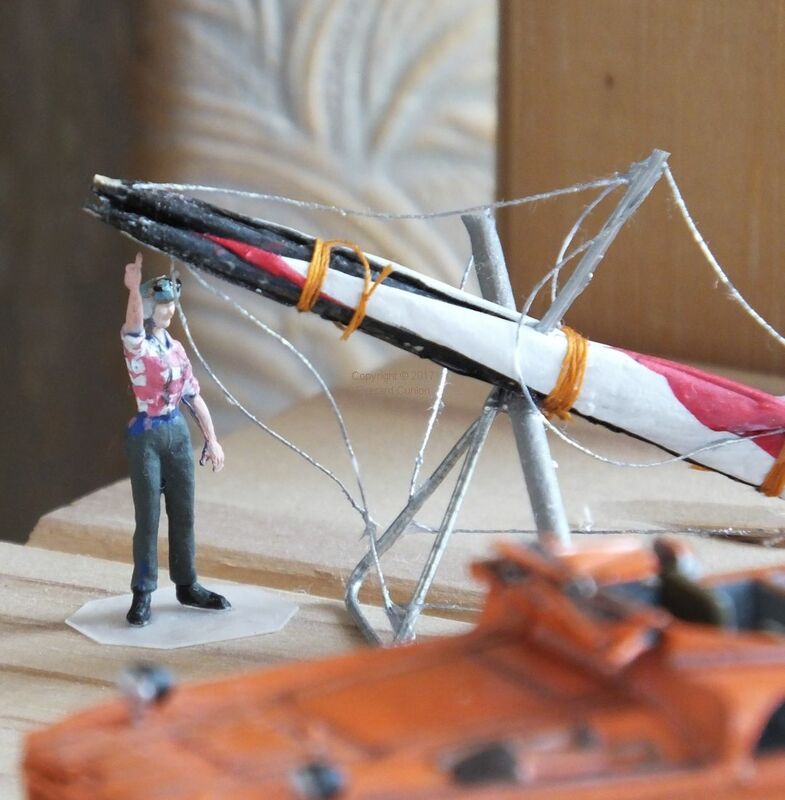 Thirty years after the end of the war that inspired its creation, at an event on an almost windless day on the California coast in May 1975, a DUKW ferried hang gliders and their pilots the mile from the car park to the top of the 450 ft Guadalupe Dune. That is the example that my model depicts. Seldom do “wheels” of any kind attract even a glance at a flying site. But the bright orange amphibious “duck” that shuttled people and gliders back and forth was an attraction in itself. The $1 fare was a bargain. One pilot who attended the Guadalupe dune hang gliding event described it in the UK hang gliding magazine as dayglo orange and another author, in the US magazine, described it as bright orange. To allow for possible over-enthusiasm of the writers involved, I used plain orange. The configuration of the Duck – wheel guards fitted, windshield folded down, splash guard down, no canvas top, and no gun mount – is based on black and white photos in those articles. The width of the actual content of this photo is three inches (8 cm). The folded up harnesses are based on the flight bags that come with the aircrew/ground crew sets (as did the helmet) with bit of bent wire for the stirrup and some chords made either from stringy Bostik (glue) and/or cotton thread. 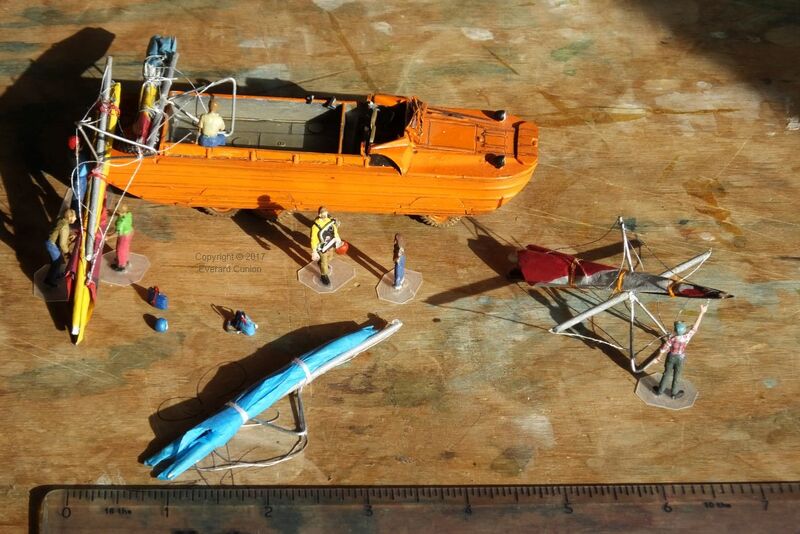 The ladder on the port side of the DUKW, visible in the photo in Ground Skimmer, is from my spare parts box. Among the kites there were Seagull 3s and 5s, Dragonflies, Bennett Phoenix, Swallowtails, Quicksilvers, Conquests, three Icarus 5s, and Volmer with his VJ24. We no longer refer to hang gliders as kites (a hangover from World War 2 slang) but there is a scratch builder’s paradise in that one sentence. The Seagulls had parabolic curved leading edges and the Ultralight Products Dragonfly had a short keel and ‘truncated’ tips, which gave it a yaw characteristic that imparted a uniquely graceful motion in the air. The Quicksilver was a fabric and tube hang glider with a straight wing and tailplane, and a rudder connected to the seat harness. It had no ailerons or equivalent, but its exaggerated dihedral caused it to bank in turns. The Icarus 5 was a tailless rigid with drag rudders, and Volmer Jensen’s VJ-24 was an aluminium and fabric sailplane with a hang cage instead of an enclosed cockpit. However, my hang gliders are ‘standard Rogallos’ plus one Seagull 3. I made them out of tissue paper, cocktail sticks, wire, thread, glue, and paint. I could write a short book about the trouble I had scratch-building them, but it would not be an interesting book. You might notice that the glider with the blue sail has parabolic curved leading edges like the Seagull 3. I formed the curves by semi-breaking the cocktail stick airframe tubes at several points. Unfortunately, I made a mistake (one of many) and I had to cut the keel short, so it is more like the Seagull 4 of a few years later. However, the difference is not apparent in the finished item in its de-rigged state. 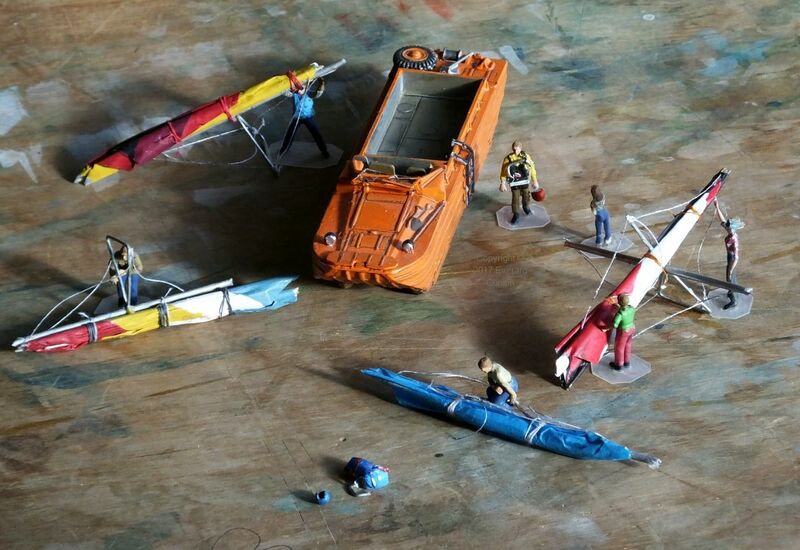 The actual content of this close-up is just over two inches (6 cm) wide measured at the hang glider. 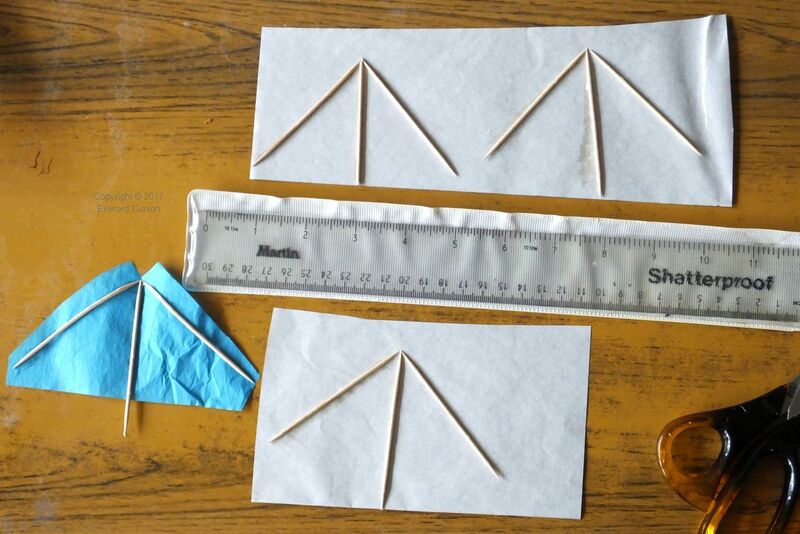 Referring to the hang glider close-up: The rolled up sail is tissue paper and the larger airframe tubes, which are rather too thick, are wooden cocktail sticks. (Only the cross-tube is visible because the leading edge and keel tubes are inside the sail.) 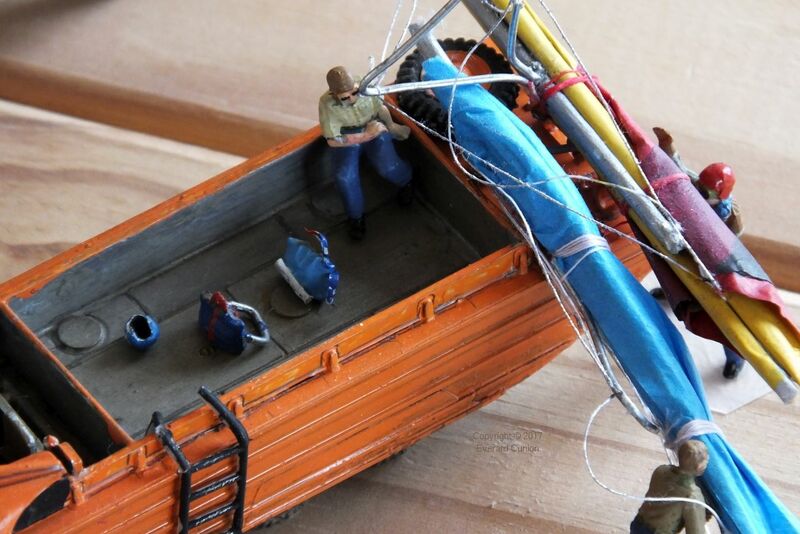 The control frame is a piece of bent wire, the king post is polystyrene ‘stretched sprue’, and the rigging cables are cotton thread, as are the sail ties. 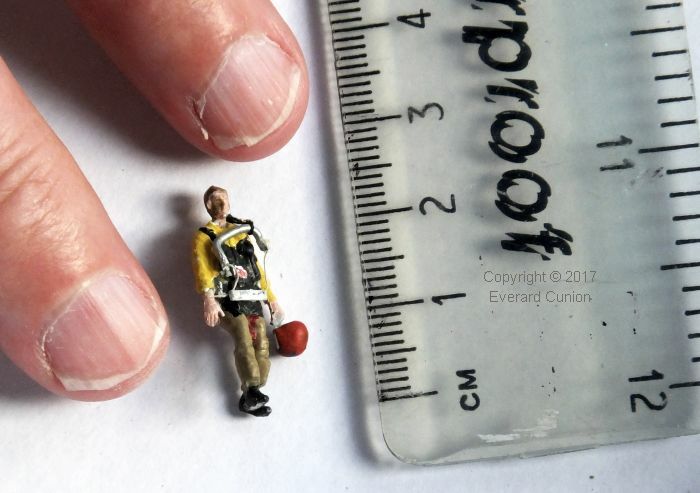 The figure is one inch (2.5 cm) tall. 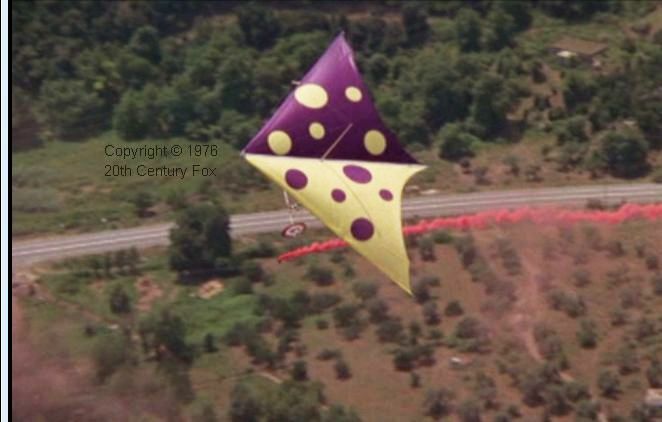 They would fold up the kite in a slap-dash manner, load as many as possible on a few vans, and floor the gas pedal all the way back up the hill with those triangular gold, black and yellow control bars hanging all over the roofs of the vehicles in a tangle of wires. The polka-dot sail Wills Wing Swallowtail in the accompanying photo is visible parked on the sand in one of the photos in Ground Skimmer. It (or another identical wing) was used later that summer for the making of Sky Riders starring James Coburn, Susannah York, and others. 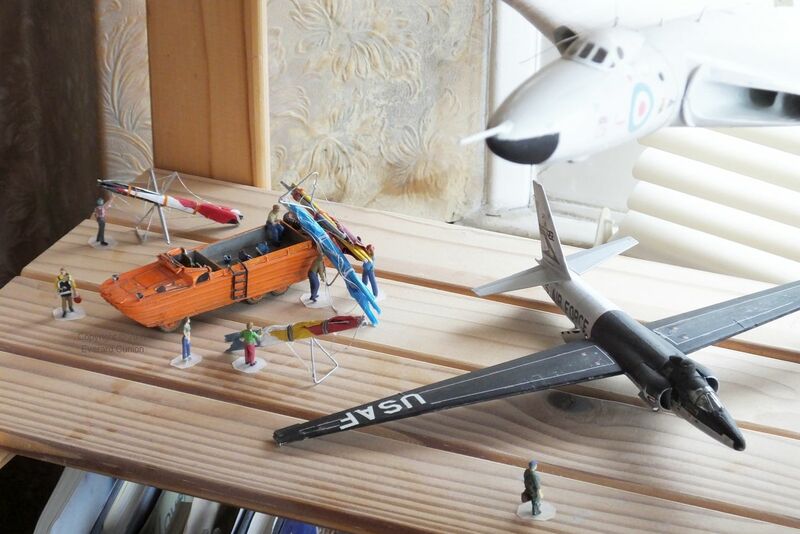 So there is plenty of potential for adding to this set of models if I am ever short of a challenge!